Previously, I posted about my difficulty in creating questions for my book discussion group project. But I finally came up with some, hooray! You can view the finished project here (including book summaries and all the discussion questions I slaved over.) I spent a lot of time thinking about how to talk about race and culture in a way that didn’t sound awkward. I think this is something a lot of white Americans spend a lot of time thinking about (or else no time at all). I ended up calling my project the “Multicultural Voices Book Discussion Group,” though I’m still not happy with the name. Ultimately, I think discussion of race and culture is something that can often be done more effectively in YA books than in adult books. (I think this might also be true of sexuality.) YA books often deal with a search for a sense of self, which includes a search for racial or cultural identity. 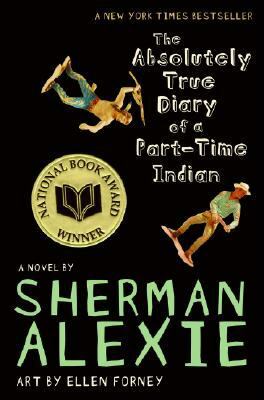 YA narrators can often pull off a more self-conscious discussion of race than adult narrators. This is important on a literal level as well as on a metaphorical level. Too, young people are more accepting of change. It’s realistic to have YA characters questioning the status quo in a way that many adult characters would be incapable of doing. (Not necessarily the case, of course. Look at Atticus Finch.) Even so, it’s hard to talk about issues of race without talking about race and being too heavy-handed. Racism as experienced today is subtle. We no longer have “whites only” drinking fountains, but wealthy suburbs might have de facto whites only schools. Young black teens might not be explicitly barred from entering certain stores, but they might be tailed by security the entire time they shop (as seen on The Fresh Prince of Bel-Air). Also, discussing race does not have to equal talking about racism. Books, YA and otherwise, can feature characters celebrating their culture, or even taking it for granted. We can and should have books about black characters who aren’t defined by being black. We also can and should have books about white American characters who seriously engage with what it means to be white. I can’t think of any YA books that really do that. If you know of any, please leave them in the comments! Alternately, please write one. I picked these eight not necessarily because they are my eight favorite books, but to provide a variety of viewpoints and racial/cultural identities. Of these, my favorites are The Absolutely True Diary of a Part-Time Indian (an instant classic and a must-read, in my opinion), Ten Things I Hate About Me, and Ask Me No Questions. Cuba 15 by Nancy Osa is another great novel, and I really admire the way it shows its protagonist grappling with all the political and personal ramifications of being Cuban-American. In retrospect, I probably should have included this book instead of Return to Sender, and I say this as an ardent admirer of Julia Alvarez’s work for adults (In The Time of the Butterflies is an all-time favorite.) Return to Sender is the only book of these eight with a white narrator, and it’s really more of a middle grade novel than a YA novel. PS: I have a future blog entry in mind that will be dedicated to giving Justine Larbalestier a gold star for her YA books and their treatment of race. I am sure you’re all on the edge of your seats waiting for it. What are your favorite YA novels that deal with race? Are they by Justine Larbalestier? Why or why not?